It's time to catch up with another former regular contributor (from this blog's days as All Freelance Writing). This week's guest is Rebecca Garland. Rebecca covered not only issues related to being a work at home parent, but also grammar and ESL topics thanks to her experience as a high school English teacher in her full-time job. 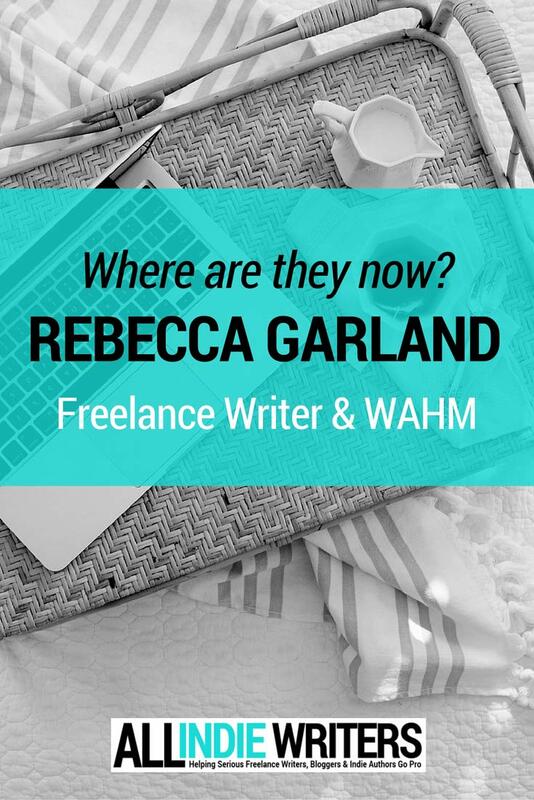 Rebecca has been writing for clients for 11 years now. Even years ago when she was a regular contributor to the blog, she was earning a full-time freelance writing income in addition to a full-time teaching career and raising her two sons (now ages 9 and 11). Even on my best days, I couldn't hold a candle to Rebecca productivity-wise. She has to be superhuman. There's no other explanation. Full-time job. Part-time writing career. Full-time mom. And she still holds two or three jobs for her sons' Cub Scout pack and swim team. I'm exhausted just thinking about it! Let's see what Rebecca has been up to and what wisdom she has to share with the rest of us about achieving her special brand of work-life balance. Tell us a bit about your specialty these days and how you got into it. Do you focus entirely on web copy and online content? My specialty these days is working with previous clients, believe it or not. I have done very little marketing over the last few years by choice, but I still work steadily part-time with clients I’ve had for more than ten years. I don’t have a niche specialty per se, but I have become a de facto “in-house” freelance writer for several clients who keep a steady stream of projects heading my way with blog posts, site content, newsletters and the occasional press release. I’m afraid I don’t have an impressive answer for this one. I have scaled back quite a bit and only write part-time. I haven’t been involved in any fabulous start-ups or been featured in the New York Times. I’ve just been doing what I’ve always done – balancing all of the jobs, all of the children, all of the other obligations and doing my best to keep my head above water. Same old, same old! 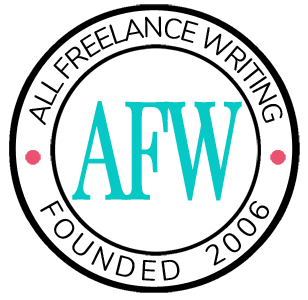 What's the biggest change you've seen in the freelance writing industry (or in your particular market) since your days writing for All Freelance Writing? Every industry goes through periods of growth and shake-out, and after doing this for more than a decade, I’ve seen some serious growth and some serious shake-out. I’ve always appreciated the job that serious writers do online. It’s like selling shovels to the gold miners. There will always be miners who make more than I do and strike it rich with online schemes and marketing. There will also be collapses and shake-out online when those same marketers fade away and lose money or interest. Meanwhile, I’ll never strike it rich, but I make a comfortable living selling shovels to each new generation of miners who are looking for big money. I’ve noticed the death of forums to a certain extent over the last few years and there seem to be less of a frenzy of writers trying to undercut each other, but I am admittedly out of that game and not in a position to observe it if it still does occur. I’m still doing the same sort of writing and work online that I’ve always done, but I’m doing considerably less of it. Once upon a time I was able to balance two full-time jobs because babies and toddlers have early bedtimes and there were bills to be paid. Now, years later, my 9 and 11-year-old don’t go to bed at 7pm and there is not as pressing a need for a large writing income. I still work online because I enjoy it, and I make a healthy part-time income by writing for clients, but I have moved to very part-time to balance obligations and avoid burning out, which was a very real possibility for a while. Understand, however, that I am not fading away completely. I’m taking a breather, if you will, in the writing career for now, but I plan to keep it going steadily at a manageable rate until I feel like ramping it back up again. I also write a lot of grants and projects for my school, which uses the same skill set, but is unpaid – just a part of being a teacher with a special skill. I may springboard from that skill at some point as well and look into more grant writing. You used to cover issues affecting work at home parents for the blog. If you could give one piece of advice to others trying to juggle a part-time writing career alongside a full-time job and family responsibilities, what would you tell them? In other words, what the heck is your secret?? There are two big not-really-secrets to keeping up with as many things as I did then (and technically still do). The first is to be organized. I live and breathe my calendar. I arrange obligations on my calendar and then I get them done accordingly. That often means starting the day at a sprint and staying there until my bedtime 18 hours later, but there is great satisfaction in crossing things off the list. To be effective with your organization, you also have to understand realistically how long it will take you to complete certain projects and what your mental energy level will be at a certain time of day. Don’t schedule yourself a 2000-word article on the same day you’re leading the Cub Scout meeting and grading essays at school. You have to organize well to achieve balance. That being said, the second element for success is to stay in tune with your abilities and inner health. I consider mental energy a well of a certain depth. When you’re out, you’re out for the day. You can work non-stop with only 5 or 6 hours of sleep for a while, but eventually you’re going to crash and burn and need some serious recharging. Use that organization and schedule to protect yourself and your energy. Don’t overschedule yourself. Turn down projects and requests that put you over the line. If you know you have a busy week coming up, look for ways to simplify tasks within that timeframe so that you can dedicate more energy to the things that require it. My house runs like a machine Monday through Friday. We have routines for homework, meals and my kids still have a set bedtime that is religious in my house. I don’t have to think about things that are routines once the routine is set, so I make necessary plans on the weekends. I check the menus for school lunches to determine when I need to pack lunches and when I don’t. I plan the dinners for the week. I lay out five days of clothes for the boys. I hit the grocery store. Then, when Monday morning hits, we just move from one thing to another without wasting energy on decision-making for mundane things. I save that mental energy for more important tasks like working with my high school seniors during the day, working on client work in the evenings and spending quality time with my kids in between. Check back next week (or subscribe to posts via email) when I'll catch up with another former All Freelance Writing contributor, Chris Bibey.